Price: General $30, Seniors $25, ages 17 under, $10. All tickets include dessert and adult tickets also include an engraved wine glass. Colla Voce Chamber Singers, the adult performing ensemble under the umbrella of the non-profit local organization Colla Voce of the Sierra, will host its annual spring concert series at the General Gomez Arts and Events Center in Auburn. 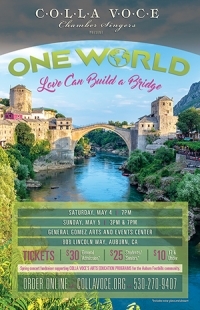 The concert will feature an eclectic mix of folk, pop, and spirituals with uplifting messages, including “Love Can Build A Bridge” by The Judds, “1000 Beautiful Things” as recorded by Annie Lennox, Carly Simon’s “Let the River Run,” “From Now On,” from the popular movie The Greatest Showman, “Bridge over Troubled Water,” as well as some beloved American folk songs and spirituals. This spring event will raise funds to support Colla Voce’s arts education programs for the Sierra Foothills communities, which include the Chamber Singers, the Colla Voce Youth and Children’s Chorus, and a Music Docent program in Auburn area schools serving 1000 children.